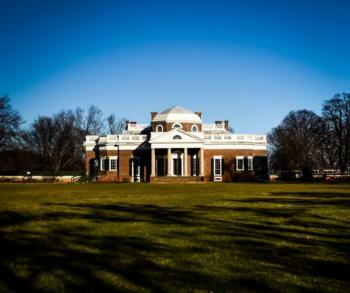 Monticello and the University of Virginia in Charlottesville are the two major works of Thomas Jefferson (president, writer, architect), and outstanding examples of neoclassical architecture. He was inspired by Andrea Palladio's Four Books of Architecture and several trips to Europe. 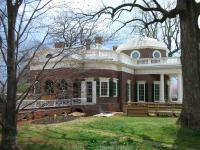 Monticello (1769-1809) is an example of a neoclassic villa rustica, based on a Roman design. The estate included a plantation for growing tobacco and corn, later replaced by the more lucrative wheat. It also held living quarters for his many workers and slaves. 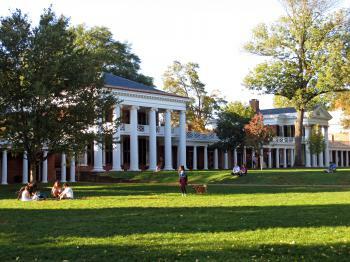 The Academical Village of the University of Virginia was based on Jefferson's educational ideals, "that learning is a lifelong and shared process, and that interaction between scholars and students enlivens the pursuit of knowledge." Its most famous building is The Rotunda, which sits at the north end of the Lawn. I was already present at Monticello at 8 am, fearing that this may be a very popular attraction. And indeed, a group of schoolchildren also just arrived. Fortunately they got on their own tour and I didn't see them again. While waiting for the shuttle bus that takes you to the house, I admired the new visitor center that has just opened a few days ago. It has reserved ample room for a huge museum shop. There's also an exhibition about Jefferson as an architect, how he designed, built and where he got his ideas. Well done. The tour takes about 30 minutes and takes you through the rooms on the ground floor. The house has period furniture in it, though not all belonging to Jefferson. He died bankrupt and much was sold after his death (including his slaves). Via the use of sky lights and high windows the rooms appear very bright. 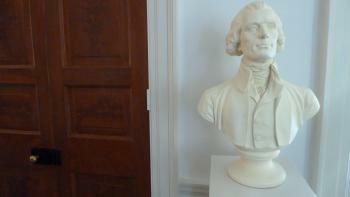 The tour is quite superficial, and deals mostly with Jefferson as a person. After that you're free to roam the grounds on your own. That includes the underground passages and Mulberry Row, where the labourers and slaves lived. Later I also paid a visit to the Academical Village of the University of Virginia. I didn't succeed at first (in the morning) because all parking spots in the immediate area were already taken. All those American students with cars of course! So I returned after dinner. It's really worth the effort. The students live in small rooms that hold nothing more than 2 beds and some personal stuff. As it was a warm evening, most of them had their doors opened up to the central lawn. Especially if you're over 30 you might feel a little out of place here. But you're free to have a look around. You'll be overwhelmed by its strong neoclassicist layout. In January I took an East Coast road trip in the US to see friends I'd left when I started traveling, deal with some paperwork stuff, and go on a work trip. I was able to see three UNESCO sites: Independence Hall, Monticello, and the Statue of Liberty. Monticello was the only new one on the trip, but seeing a trio of very patriotic places back-to-back was really fun. Monticello is the hardest place for me to see of the three though. Since it was a working plantation that housed hundreds of enslaved peoples, it was very hard to separate Jefferson the philosopher president from Jefferson the slaver. Read more from History Fangirl here. With 4 days left in my October 2016 trip to the USA I had arranged for myself an excursion to a third WHS of the trip. I caught a subway and a bus to New York’s domestic-only La Guardia airport to catch an American Eagle flight 300 miles southwest to the city of Charlottesville, Virginia. On arrival I took a fairly expensive taxi to my hotel in the city and had a walk around the university's tranquil campus. I read in Christopher Hitchens' biography of Jefferson that his motivation for building the university was to limit the exposure of Southern minds to what he perceived as the propaganda of Northern universities in New England. The next morning I took another costly cab to Monticello, a few miles outside town. There is a nearby hill that rises higher than Monticello, meaning whoever occupies it would have a great view of Jefferson’s estate. In recent years a developer announced plans to build condos there, but the trustees of Monticello – determined to prevent the surrounding area being despoiled – raised $15 million to buy the land themselves. By happy coincidence, $15 million is exactly the same amount that Jefferson as president paid Napoleon’s France in 1803 to purchase all the lands west of the Mississippi, doubling the size of his country at the stroke of a pen. Thomas Jefferson was one of the United States' most fascinating Founding Fathers, not only serving as president and author of the Declaration of Independence, but also displaying keen interests in arts and science, which can be seen in the two components of this World Heritage Site. Monticello is an architectural joy to visit, as the many reviews on this site testify. The Academical Village of the University of Virginia is just as impressive, and is familiar territory for me from visits in my collegiate years. Jefferson intended the Rotunda and the Lawn, which is flanked by two rows of pavilions and dorm rooms, to be an environment in which faculty and students could live and study together, fostering academic growth. The Rotunda, home to classrooms and a beautiful library, remains under reconstruction, but should reopen in 2016. The Lawn is still worth a visit, though, to observe the different neoclassical styles of the pavilions on each colonnaded row. Only students in their final year of college can apply to live on the Lawn--in dorm rooms heated by fireplaces and without bathrooms--and it is considered a privilege to be one of the 54 selected each year. Faculty selected by the University's Board of Visitors live in the upper floors of the pavilions, continuing Jefferson's ideals of a joint learning environment for students and faculty. Logistics: A car is probably the best way to navigate between these two sites in Charlottesville, Virginia. From the moment we flew in to Charlottesville's lovely little airport I was rather taken with this verdant university town. Our first stop was the university itself. Sadly the rotunda was still being renovated, but it didn't take too much away from the lush ambiance of the central quad. We walked a lap, ducking into the committee room/library, which was pleasant in the way formal Georgian rooms tend to be. After that we grabbed some lunch and second-hand books on the charming high street before heading off to Monticello. Set atop a grassy hill covered in fog and trees, Monticello was a rather pleasurable place to visit. There is a nice visitor’s centre which helps keep the area around the house quieter. This area has films and displays to explain the life and work of Thomas Jefferson. Whilst tours around grand homes are some of my least favourite things to do, this one was interesting enough to actually be bearable. I think there were two main reasons for this. First, Jefferson is a much more engaging character than many of the former owners of the European palaces inscribed on the list. Second, the tour was only 30 minutes long so managed to stop before becoming too dull. I always think I am going to enjoy neo-classical architectural sites more than I do, the pleasing proportions and use of space always look good, but I end up finding them a bit dull. Monticello had a similar feel, but some of the quirky design features and historical artefacts made it enjoyable. There were plenty of other areas to explore, including the areas where slaves and indentured labourers lived which helped round out the story and contradictions of the site. Alas, the weather closed in and we also had to head off to meet some friends so didn’t get a chance to explore in more detail. I’m really glad we visited Charlottesville, it was welcoming and pleasant and Monticello is a rather iconic site directly linked to an exceptionally interesting figure. Well worth a trip if you are in the area. I visited Monticello on a day trip from Washington, D.C. It took a little more than two hours to reach the site by car and another two to get back but it was definitely worth it. The tour of his house and the surrounding areas really gives you a view of Thomas Jefferson's mind. The house is filled with priceless antiques and old books. My only complaint is that the tour sizes are way too big for such a small place; I found myself having to squeeze through people in order to view everything in the many rooms. I did not have time (and the interest) to visit the University of Virginia so I cannot comment on that but Monticello is definitely worth a visit. Monticello, which means "little mountain" in Italian, was the home of Thomas Jefferson. This architectural endeavor occupied Jefferson's mind, as he designed the house and supervised its construction, which began in 1769. Jefferson lived in France for five years while serving as an ambassador and so much of Monticello was inspired by the classical houses he saw in Paris. In 1782, a French visitor stated that Jefferson was "the first American who has consulted the Fine Arts to know how he should shelter himself from the weather." The guides are very well knowledgeable about every nook and corner of the house and landscape. I really felt like I was taking a step back in time and felt very disoriented when I left the mountain to return to "present-time" downtown Charlottesville. If you decide to visit Monticello, I highly recommend not only taking the house tour, but also the garden tour and plantation community tour. The latter focuses on the African-American slaves who worked on the 5,000 acre plantation. The garden and plantation community tours are available from April 1-October 31. I also suggest that if you have the time, purchase a "Presidents' Pass," which is a discount combination ticket giving you admission to Monticello, Michie Tavern, and Ash Lawn-Highland. The Presdients' Pass costs $26.00 US per person. These three sites are very close to each other. Michie Tavern was the social center of its community in the late 1700s. The tavern's dining room offers a wonderful Midday Fare, which features U.S. southern period dishes. Ash Lawn-Highland was the home of former President James Monroe. As for the University of Virginia, I was only able to drive through it. However, I saw the "Academic Village," which was built by Thomas Jefferson. Tours are available inside the rotunda of the University of Virginia. I visited Monticello in April of 1996 with my daughter on her 8th grade Washington DC trip. 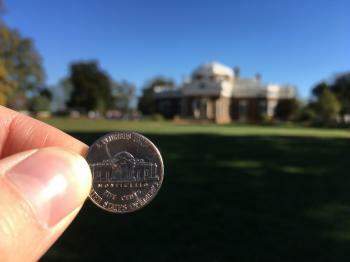 Monticello was a great experience to see. My daughter and I thought that the surrounding country side around Monticello was beautiful.We also visited the campus of the University of Virginia on a short tour, which I thought was also impressive. To be in the Washington area and not to take the relatively short trip to Charlottesville, Virginia, is really to miss a great sight. Monticello is one of the most famous residences in the world, and rightly so, since its constructor, Thomas Jefferson, was not only a politician, but also a Renaissance man of the highest order, with numerous hobbies and interests, all of which can be noticed at Monticello. The day I visited was unfortunately very foggy and rainy, but I hear you can see the Blue Ridge Mountains very well from there on a sunny day... Be sure to make the short walk to Jefferson's grave to admire his modest tombstone. He didn't want to be remembered as America's 1st Secretary of State, 2nd Vice President, or 3rd President, but rather as "Author of the Declaration of Independence, of the Statute of Virginia for Religious Freedom, and the Father of the University of Virginia". The latter can be visited as well, and is an interesting example of a classic American university with great architecture (especially the Rotunda). Nearby, the historic Michie Tavern is a touristy, but interesting place to shop and eat. I visited Monticello in 1975 and it is one of my favorite memories. You must experience the space to begin to understand the genius of Thomas Jefferson. It is a beautiful and peaceful place, a step back in time. In 1999, I visited another of Jefferson's houses, Poplar Forest, in Lynchburg, Virginia. It was even more impressive to me than Monticello. It is in the process of a very well-planned and executed restoration. You can see how the structure was originally designed and constructed. Much of the process is well documented in Jefferson's writings to his carpenter. I look forward to visiting again as restoration progresses. I spent one night in Charlottesville on the same trip and foolishly missed an opportunity to visit the University of Virginia. I am now an architecture student and many educators consider a visit to this campus essential to the education of an architect. Virginia is a beautiful state and I am glad to have another reason to return there. Slavery: Jefferson kept slaves at Monicello -both in the fields and in the house "Thomas Jefferson made a habit of inspecting his plantation in the afternoon to monitor the work of the 150 slaves who worked at Monticello and his outlying farms. Always interested in measurements and record-keeping, Jefferson made extensive notations about his slaves and their duties in his Farm Book and Memorandum Books. For instance, he noted the rations his overseer distributed, the number of yards he purchased for clothing, the daily task required by particular slaves, and the cost of items purchased for use in the kitchen." 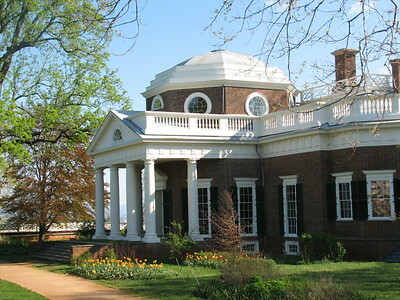 Named after individual people: Sophia Charlotte of Mecklenburg-Strelitz, the queen consort of King George III of the United Kingdom; For "University of Virginia": Virginia was named after Queen Elizabeth I of England the "Virgin Queen"
Modelled after: The Rotunda was modelled after the Pantheon in Rome. Built or owned by British: First occupied in 1770 when Jefferson was still British! Undergoing Restoration or Repair: The Rotunda at the University of Virginia is currently covered by scaffolding while it is being restored; this restoration should be completed between April and July 2016. 162 Community Members have visited.